3 boys, Jeff, born 1966, Scott, born 1970, Kent, born 1972. After College, went to work for Chevrolet Mtr. Div in 1964 in Detroit. Transferred to Indianapolis in 1970, Wabash, Ind in 1977, Cincinnati in 1978, and retired in 1998 at the age of 57. Was a member of J-Club Fraternity. Drank a lot of Beer, partied hard, skipped a lot of classes and spent a lot of time at the "Old Mill." Didn't know I was eligible to Graduate until 2 days before Graduation. Graduated from Univ. of Detroit in '66 with a Batchelors Degree in Business. Extensive travel while working at Chevy throughout the U.S.A. 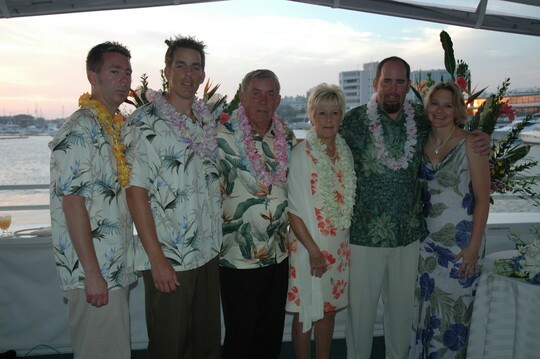 Hosted Chevrolet Dealer payoff trips to Hawaii (3 times), Alaska, Bermuda, Bahamas (3 times), Aruba, plus numerous hosting assignments in various locations throughout the U.S. Personal travel to France, Italy, Ireland, across Canada, East to West. Both my wife and I are avid golfer's and spend our Summers at our Country Club here in Ohio, and we spend our Winters in Florida, with visits to our kid's in Calif. and Pittsburg. Amelia Island, Fla and Hutchinson Island near Stuart, Fla. Send all mail to e-mail address or home address. James A. Bonnett added a comment on Profile. James A. Bonnett posted a message. James A. Bonnett posted a message. New comment added. Happy Birthday Larry from an old friend. May you have many more. James A. Bonnett added a comment on Lawrence Woodcox's Profile. James A. Bonnett has a birthday today. New comment added. Happy Birthday Stan & may you have many more. James A. Bonnett added a comment on John Mitzel's Profile. Sawyer Bonnett - 1st. grandson now age 3. This photo was taken at family day for the Pittsburg Pirates in Aug. 2009,and shows our grandson looking out at the field with the city of Pittsburg in the background and is titled "Field of Dreams"